More than two decades ago, a despondent search for a crepe pan, throughout Manhattan, ended with eventual success at the mother ship of all things kitchenware—a retail repository of every cooking utensil, pot, pan and gadget a cook or chef could dream of, and substantially more. Today, that kindred pot-of-gold in Atlanta is The Cook's Warehouse. In November of 1993, Mary Moore and fellow young chef Scott Peacock were to be leading a cooking demonstration at Greenmarket in Union Square in Manhattan, New York City—Mary's first visit to NYC as an adult. The plan was to make crepes with cooked apples. They needed a crepe pan. An exhaustive search of many stores left them empty-handed. But Scott knew of a place where they might meet with success. They went to Bridge Kitchenware, a warehouse packed to the gills with all things kitchen and cookware. They indeed found a crepe pan and conducted the cooking demonstration with splendid results. Bridge Kitchenware, founded by the late-Fred Bridge in 1964, relocated outside of New York so that the second generation owners—Fred's son and his wife—could spend more time with their family. Greenmarket, founded in 1976, continues to be a staple in NYC. Unbeknownst to others for a time, while shopping that fateful day at Bridge Kitchenware—the holy grail for New York City cooks and chefs—Mary decided, "I'm going to open a store like this in Atlanta." During a Labor Day Weekend at the beach in 1994, Mary's friends asked, "What are you going to do next?" Mary shared her idea for a cookware treasure trove of a store. Then, a friend put Mary in touch with a small bank that granted her a loan, which her grandmother co-signed. With that loan and loans from three other friends (who have long since been paid back), Mary was able to see her dream come to fruition. The funding for the store had been secured, but it still had to be built. At the time, Mary was working at Harry's Farmers Market. Her boss, Harry Blazer, was wholly supportive of Mary's dream and agreed to let Mary work only four days a week at Harry's and she spent the other three days of the week working on her dream store. Mary had grown up on a farm between nearby Douglasville and Hiram, so she immediately connected with the organic, farm-fresh concept that Harry's was offering—a concept ahead of its time. Blazer took the company public in 1993 and in 2001 it was purchased by Whole Foods. Mary's store was built with determination, motivation and the generous help of family and friends. Although incredibly hard work, Mary carries fond memories of her friends helping her build and paint the store walls—and so much more—and her mother bringing them lunch every day. With a skyline view, the first location of The Cook's Warehouse opened its doors on March 14, 1995, on Amsterdam Avenue in the bustling neighborhood of Midtown, adjacent to Morningside where Mary's parents grew up. That first store at 2,400 square feet showcased 1,500 square feet of retail space and 900 square feet of stockroom (Yes, she's learned a few tricks about space management since then...). From the beginning, The Cook's Warehouse carried kitchen essentials, as well as luxury cookwares. Mary's concept, unlike Bridge, included offering cooking classes. Within two or three weeks of the store opening, it hosted its first cooking class. Mary still has the one-page schedule from those first classes. Keep reading to learn just how much those classes have grown! Today, The Cook's Warehouse is a destination for locals and visitors alike. The stores offer more cookware and accessories than ever before—more than 15,000 products—including feature brands of All-Clad, Big Green Egg, Capresso, Cuisinart, Jura, Zwilling J.A. Henckels, KitchenAid, Le Creuset, Shun, Woll, Wusthof, and others. They're the largest distributor of Big Green Egg grills, selling more than any other store in Atlanta! A significant perk of shopping for gourmet cookwares at The Cook's Warehouse is the offering of "test runs" before purchase. The Cook's Warehouse operates the largest avocational cooking school in the Southeast conducting more than 800 classes yearly, often taught by local chefs. The most popular class continues to be "Knife Skills". 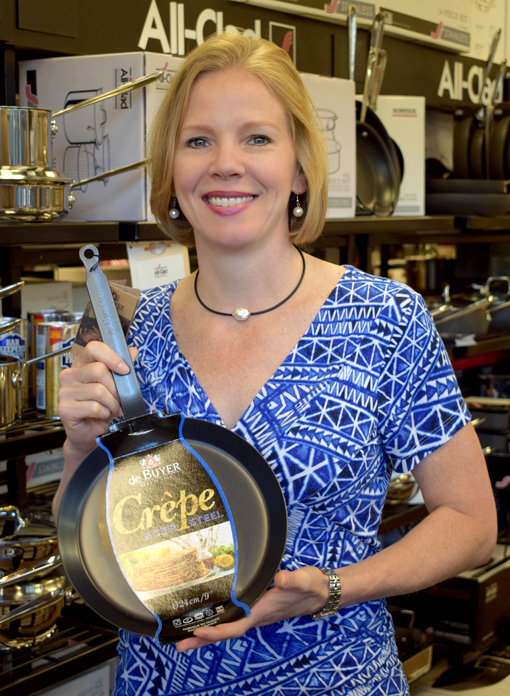 Mary still owns that very same crepe pan that she purchased in Manhattan in 1993 and it's the same brand—de Buyer—that she sells in her stores today. She's made it abundantly clear to the store's inventory buyer that they're never to run out of that pan. In my personal experience, I've not known them to ever be out of anything! The Cook's Warehouse is a partner with virtually every major cooking event and gourmet association in Atlanta. Mary is a member of Les Dames d'Escoffier International - Atlanta Chapter and The Cook's Warehouse won the organization's "Global Innovator Award" 2007-2008. Mary serves on the Advisory Board for the International Housewares Association and is the Immediate Past Chair of the Board of Directors of the Atlanta Community Food Bank. Mary jokingly calls The Cook's Warehouse her "22 year hobby" because she loves it, but anyone who has started and sustained a business knows that it's a lot of hard work. What she has brought to the community and given back to the community, along with her enthusiasm, charm and bright disposition, has won her the hearts of every Atlantan I know who knows her. The newest location of The Cook's Warehouse is slated to open at Peachtree Station in the Atlanta neighborhood of Chamblee in early August! The new store will feature all the wonderful aspects that fans of The Cook's Warehouse love and look forward to, including featured brands, cookbook signings, grilling demonstrations, and their super-popular cooking classes. Now a tradition at The Cook's Warehouse, local chef and food stylist Gloria Smiley will conduct the first cooking class at the Peachtree Station store. Gloria was the hosting chef at the first cooking class at the Ansley Mall store and the East Cobb store. Gloria is a founding member of Les Dames d'Escoffier International - Atlanta Chapter (LDEI), of which Mary is also a founding member. That first class is slated to happen very shortly after opening. While to store will have a soft opening in the coming days, the official Grand Opening is set for late August. On Thursday, August 24, there will be a benefit event, with the executive chef from Wusthof as a guest of honor. The evening's proceed will benefit the Culinary Futures scholarship from LDEI. Friday, August 25 is the Grand Opening which will be open to the public, a spectacle not to be missed. There will also be special events throughout that weekend. Nestled in a foodie paradise, the new store is next to a Whole Foods (see how that came full circle? ), multiple restaurants, and it's conveniently surrounded by several bustling neighborhoods, and it's a very short distance from Interstate-85 (*hint, hint* to those visiting from out-of-town). Read more about the Peachtree Station store in one of my previous stories. Unbeknownst to Mary, I returned to the store in Ansley Mall after our interview to buy my own crepe pan. 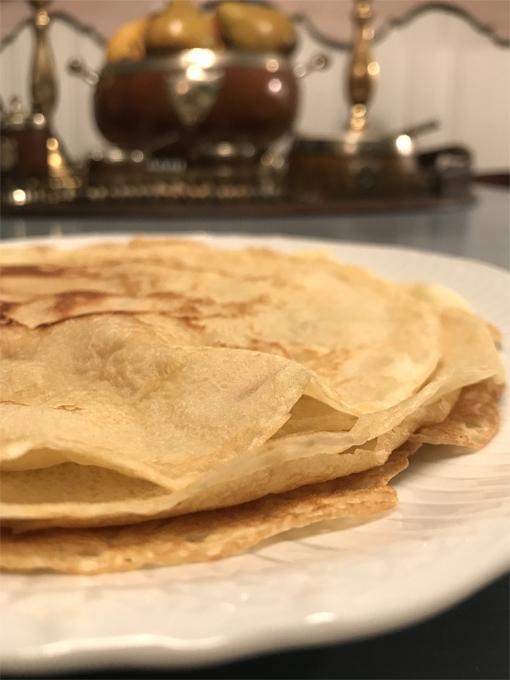 I've enjoyed crepes in many restaurants, but I'd never made them myself, which is surprising given how much I love to cook—I've been cooking since I could reach the stove! 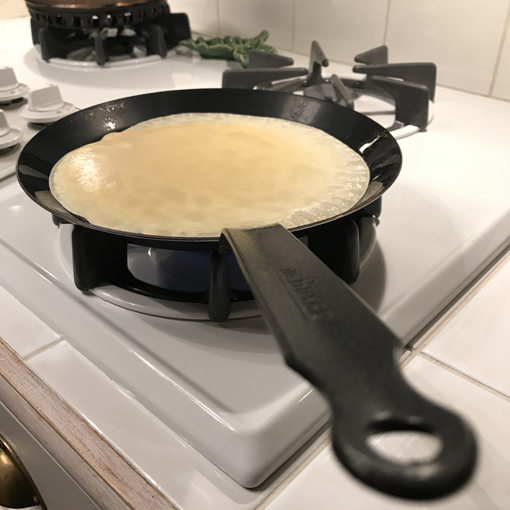 I could hardly wait to use my new crepe pan! I turned to Julia Child—an inspiration to Mary, me, as well as many of you, I'm sure—for the crepe recipe. I referenced fellow foodie, baker and travel writer Foodie Baker for her step-by-step blog post—a huge assist! And I got a few tips from my chef friend Cameron. Inspired by Mary's "Founder's Story", I decided to make crepes with cooked apples, like she did in New York City...the catalyst for her starting The Cook's Warehouse was my inspiration to make crepes for the first time! Making crepes was as much a learning experience as it was fun. Do make the crepe batter with enough time to let it chill for at least two hours or overnight. I made mine the day before. Do have patience! When you start cooking the crepes, much like when you're making risotto, your attention must be wholly on the crepes. Do allow some batter to be used for finessing your pan heat and the thickness of your batter. Adjust in small increments. I love cooking from scratch and that's exactly what I did for every component! Cooking the crepes...I worked quickly and learned quickly! The cooked crepes! The next to last one split—I got too anxious—but the rest were perfect! 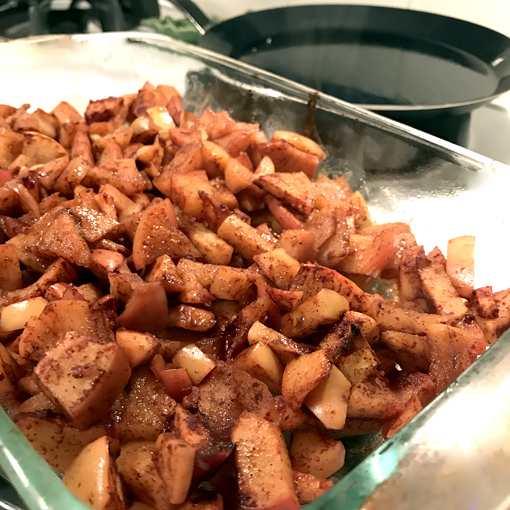 The cinnamon cooked apples were super easy! I used LOTS of cinnamon! 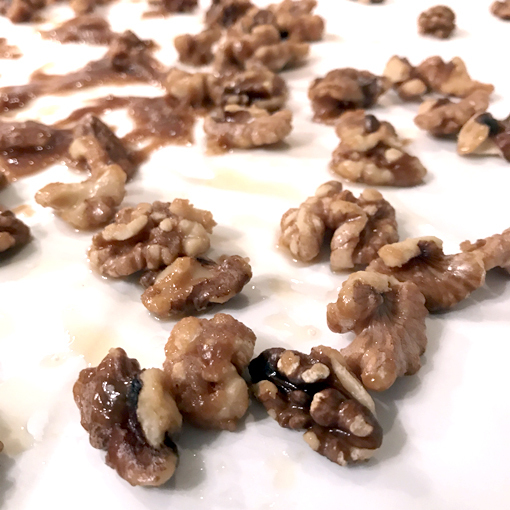 And candied walnuts are super-duper easy, too! 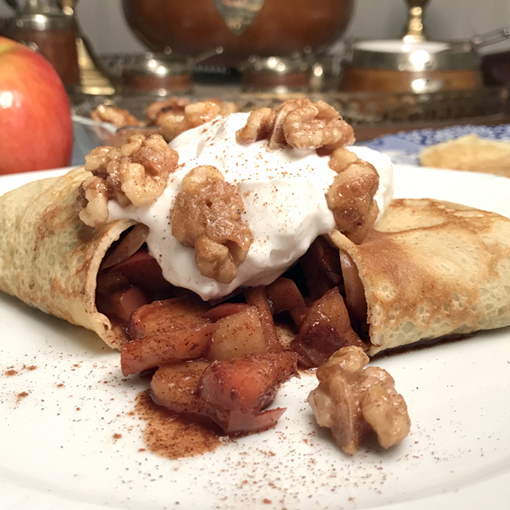 Yes, I heard "crepes with cooked apples", but I got creative, as I often do in the kitchen. And, voila! The finished dish... Crepes with Cooked Apples! I do love to cook! And I get the feeling that I'll be using my new crepe pan for LOTS of different kinds of crepes. Next, I'm going savory! A desperate search for a crepe pan in New York City led to what has become a destination in Atlanta. The Cook's Warehouse is the place to go for cooks, chefs, culinary students, cooking enthusiasts, as well as out-of-towners. I've shared with Mary that every time I visit the store, I always find what I'm looking for AND I always find something I didn't know I needed—it's one of my favorite stores to browse and shop. If you're visiting Atlanta, look to The Cook's Warehouse for your wishlist kitchenwares and souvenirs for friends and family! It delightfully lives up to its tagline. The Cook's Warehouse will indeed give you "Every Excuse to Cook".